Be the first to share your favorite memory, photo or story of Buford. This memorial page is dedicated for family, friends and future generations to celebrate the life of their loved one. 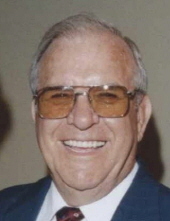 Buford Yates, 86 years of age of Grundy, VA, passed away Sunday, January 20, 2019 in Abingdon, VA. Born April 22, 1932 in Grundy, VA, he was the son of the late Lawrence Thomas and Bertha Smith Yates. Buford was a 1952 graduate of Grundy Senior High School, a United States Army Veteran having served during the Korean War stationed in Japan. He was a 1963 graduate of the Cincinnati College of Mortuary Science, and had worked as manager of Buchanan County Funeral Home for twenty-two years, where he helped families honor their loved ones until his retirement in 1992. After his retirement, he worked part time for Virginia Funeral Home and Shortridge-Ramey Funeral Home. He enjoyed doing yard work and riding his John Deere, was of the Baptist faith and a member of the Grundy Masonic Temple Lodge # 17AFAM. A loving husband, father, brother, grandfather and great grandfather. In addition to his parents, he was preceded in death by his sisters, Edith Faye Compton, Gusta Rife, and Lourena Yates; one brother, Otis Warren Yates and granddaughter, Kendra Myers. Those left to cherish his memories include his loving wife of sixty-six years, Sue Francis Yates of Grundy, VA; daughters Cathy Yates-Myers of Oklahoma City, OK, Vicki Yates White and husband Dennis of Grundy, VA, Margaret Yates Vance and husband Dale of Bluefield, VA, Nancy Yates Hess and husband Jeff of Abingdon, VA, Mary Beth Yates Hylton and husband Steve of Abingdon, VA, and Sarah Yates Taylor and husband Travis of Charleston, WV; one sister, Alta Cox of Grundy, VA. He is also survived by twelve grandchildren: Richie L. (Jessica) Myers of Oklahoma City, OK, Lesley (Rick) Rife of Manassas, VA, Kelli White (Mark) Curtis of Beaver Dam, VA, Amy Vance (Adam) Wiley of Reidsville, NC, Jason Vance of Brooklyn, NY, Caitlin Vance of Bluefield, VA, Andrew Vance of Bluefield, VA, Nathan Hess of Asburn, VA, Haylee Hess of Abingdon, VA, Carter Hylton of Abingdon, VA, and Lindsey and Lauren Taylor both of Charleston, WV; eight great-grandchildren: Jace and Blakely Myers, Hudson, Warren, Ada, and Hazel Curtis, Bo and Violet Wiley and numerous nieces and nephews. Funeral service for Buford Yates will be held at the Shortridge-Ramey Funeral Home Chapel of Grundy, VA, Sunday, January 27, 2019 at 1:00 pm with Evangelist Hobert Kennedy officiating. Burial will follow in the Mountain Valley Memorial Park in Big Rock, VA. Full military rites will be conducted at the cemetery. Active pallbearers will be Mark Curtis, Jason Vance, Andrew Vance, Nathan Hess, Carter Hylton and Richie Myers. Honorary pallbearers will be his sons-in-law: Dennis White, Dale Vance, Jeff Hess, Steve Hylton and Travis Taylor. The family will receive friends at the Shortridge-Ramey Funeral Home of Grundy, VA, Saturday, January 26th after 6:00 p.m. The family of Buford Yates have entrusted the care of their loved one to Shortridge-Ramey Funeral Home of Grundy, VA.
"Email Address" would like to share the life celebration of Buford Yates. Click on the "link" to go to share a favorite memory or leave a condolence message for the family.